How does the Royal Enfield Bullet Classic 500, on sale now in the U.S., compare with the SYM Classic 150, due to go on sale in March 2010? Incredibly, we already know, in part. Phil Waters of POC Scooters took a pre-production SYM Classic 150 on a road trip, accompanied by a new Royal Enfield C5 (as the Bullet Classic 500 is called). He wrote up his impressions of the SYM Classic 150 for the blog 2StrokeBuzz. The Royal Enfield is mentioned only in passing but, if you read between the lines, it sounds as though the two motorcycles kept pace admirably and even burned the same amount of fuel. Waters referred to the Taiwanese SYM as "the Wolf 150" but the Wolf name has been dropped for the U.S., according to Pete McIntosh. He is with the marketing department of Carter Brothers Manufacturing, exclusive U.S. distributor for SYM. The Classic 150 is just one of the SYM scooters and ATVs Carter markets here. One really cute SYM product is the Symba, by all appearances the rebirth of a Honda Super Cub step-through. The "hunter green" version of the SYM Classic 500 will be sold with a standard bench seat, but the solo seat, pillion pad, left-side saddlebag and front pedestrian-slicer license plate will be available. The license plate will say "SYM 1954," marking the birth of the company now known as Sanyang Industry Co. Ltd., or SYM. 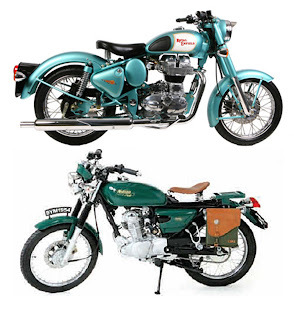 The 1954 notation, green color and options could all be seen as a tribute (or a challenge) to Royal Enfield, in business since 1955 in India. The two-tone red and white SYM Classic 150, looking more like a small Japanese motorcycle of the 1970s, will be sold as well. McIntosh and SYM enthusiast Nate Dahl tell me the SYM Classic 150 is a four-stroke motorcycle, with 5-speed manual transmission, carburetor, electronic ignition and a curb weight of 266 pounds. Carter Brothers is targeting an introductory price of only $2,999. McIntosh said they hope the bike will prove popular with motorcycle training courses. Will the SYM Classic 150 prove popular with riders who were considering buying a Royal Enfield Bullet Classic 500? To me it's not quite my style. I think it looks a bit like my electra (although not as nice:) with the AVLs 60's styling but with the classic 50's & 40's bits bolted on. A somewhat in between.. If it go's well and the build quality is as good as the Bullet's then I'm sure it will have a market. Good luck to them. They are similar in design but miles apart in displacement. Think of the SYM as little brother to the RE. I weigh 200 pounds and a 150 would not suffice for more than around-town stuff. For new riders, small people, beginners, and those who only travel short distances or on smaller streets or country roads, the SYM should be fine. Take away the single seat and you've still got a Honda clone. No comparison!! Phil waters weighs at least 200lbs, and had it to 82 (gps) mph! Sure it's a light weight, so some people wouldn't do longer rides for fear of rider fatigue(? ), but I've been doing it on a 230lb 10 inch wheel scooter for five years, and I can't wait to rock a customized SYM Classic 150! Sure it won't blast in a straight line like my CBR400, but I'd embarrass bigger bikes on smaller roads all day long. Anyway, we need more small bore motorcycles to choose from. La verdad que la comparacion solamente es posible en lo estetico, la Bullet tiene una personalidad muy britanica en cuanto a su motor mucho mas clasico. La Sym tiene mucho mas nervio pero esta limitada por su cilindrada. A pesar de esto soy fanatico de la Wolf. "The truth is that the comparison is only possible in the aesthetic, the Bullet has a personality very British in their engine much more classic. The Sym has much more nerve but is limited by its capacity. Despite this, I'm a fan of the Wolf."